Now that we know that a major scale is made up of a particular pattern of intervals between the notes (W W h W W W h), let's test the formula by building a major scale on the note A, starting with the open A string. What is a 'Power Chord'? Take the Power to the Top! Learn D and E.
EVERY Power Chord Has a Name! What's a 'Half-Step', and a 'Whole-Step'? What's a 'Sharp'? What's a 'Flat'? Essential Exceptions! E to F, and B to C.
What is the 'Major Scale'? 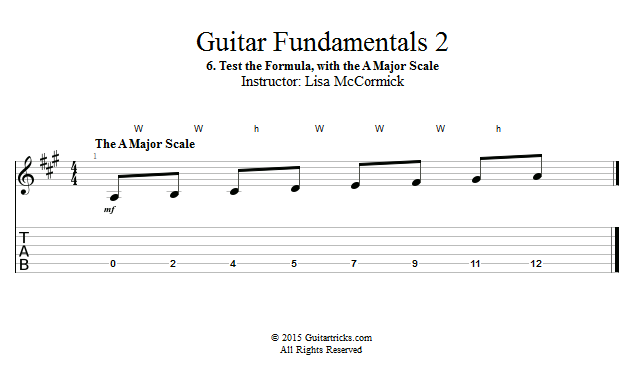 Major Scale 'Magic Formula', Revealed! Use the Formula to Find Essential Power Chords! One Little Pattern, ALL Major Scales. Easy! The Scale is All in the Magic Grid! Ok, WHY Did We Play it Backwards First? The Grid Moves, the Scale Moves Too! 'Open' Major Scales, and Cool Ways to Use Them! Put the D Scale to Work, Making Music! Put the E Scale to Work, Making Music! Put the A Scale to Work, Making Music! What is the 'Magic L'? Discover the Power of the 'Magic L'! MOVE the Groove, Like Magic! Groove Play-Along, in 3 Keys! The 'Magic L', in Reverse! Move the New Groove, Like Magic! Play Along with the Groove, in 3 Keys! Power vs. Open Chords, What's the Difference? Play Along with 'I Get It Now', Full Power! 4: What Is A Chord, Really? What's a 'Major Chord' Made Of? Most Chords Have More Than 3 Notes, But Why? So, How Does the G Major Chord Work? 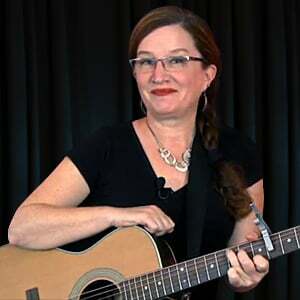 Do ALL Major Chords Work the Same Way? What is a 'Minor Chord' Made Of? What is a 'Suspended 4th' Chord? What About MINOR Sus4 Chords? What is a '7th Chord'? Which Barre Chord Form Should I Use? Rock Your Barre Chords with the 'Magic L'! Barre Chords LOVE the 'Magic L'! Reverse that 'L', Find Those Chords! What is the 'Minor Scale'? What is a 'Relative Minor' Scale, or Key? Quiz! Who is E Minor's 'Major Cousin'? One Little Pattern, ALL Natural Minor Scales. It's Easy! Musical Notation vs. Tablature, What's the Difference? Every Good Boy Does Fine! What About the Higher Notes, Above the Staff? What About the Lower Notes, Below the Staff? What About Sharps? What About Flats? What is a 'Key Signature'? How Long Should a Note Last? What is a Whole Note? What is a Half Note? What is a Quarter Note? What is an Eighth Note? Musical Notation in Action! Let's Play a Melody! Notes, Plus Timing, Equals MUSIC! Grand Finale! Read Melodies, Add Harmonies! Play Along with 'Ode to Joy', with Harmony!